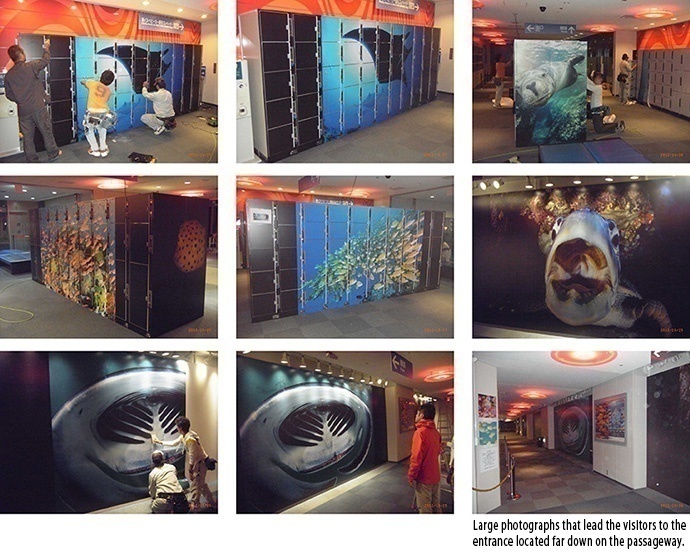 The walls and the surfaces of coin-lockers were decorated with super large photo printing of beautiful creatures under the sea taken by Yasuaki Kagii. The walls and automatic lockers in “Kaiyukan” were decorated with the photographs by Yasuaki Kagii. The world of mysterious underwater was recreated in vivid colored photographs printed by Mimaki’s printer. 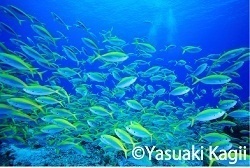 Collaborated with “Photo exhibition of underwater photographer, Yasuaki Kagii” that is now held in “Kaiyukan”, which is one of the most famous aquarium in western Japan. Akashi Create Co., Ltd., a user of Mimaki JV34-260, printed and constructed the large photo exhibition on the third floor of entrance building of Kaiyukan and wrapping of its automatic lockers with JV34-260. Visitors’ response is very good. Usually they just pass through the passageway but after the photographs are exhibited, they stop and appreciate the photographs. Children often give a cheer and families and couples snap some shots. Also, the finish of wrapping of automatic lockers is exquisite and many visitors say that the entrance has been decorated more aquarium-like. Also as secondary effect, the photographs are preventing visitors from getting lost. Before the photographs are exhibited, some visitors had troubles looking for arrows or some even went the opposite direction. However, after the photographs are exhibited, visitors do not get lost anymore and have no troubles to go in the right direction. We were amazed at this unexpected effect. Visitors can go along large photographs and they lead visitors to the entrance. It must be much easier for visitors to get to the entrance rather than having troubles with finding an arrow sign. The personnel of Kaiyukan also mentioned that it gave him a good opportunity to reconsider the effectiveness of traffic line. This case might give Mimaki and our customers a clue to find the effectiveness of signs and their roles. Yasuaki Kagii Photo Exhibition will be held until February 5, 2013. The fee is included in the entrance fee of Kaiyukan. 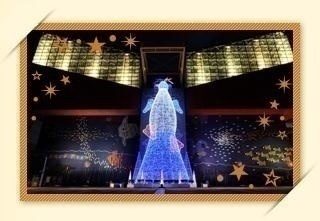 Also lighting up named “Kaiyukan Winter Paradise” is held in the same period (until February 5, 2013) . Please visit Kaiyukan if you have not already. Born in 1971 in Hyogo Prefecture. An underwater photographer. 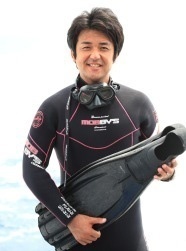 Studied under the underwater photographer, Mr. Katsutoshi Ito while at university. From 1993, moved to Australia and Maldives to dedicate himself to shoot underwater photographs. Returned to Japan in 1998 and started working independently as a freelance photographer. As an underwater photographer, he is trying to stick at a shooting method that follows nature's rhythm and not to make the impact on the underwater creatures. He has received many awards such as the 15th Anima Prize (Heibonsha Limited, Publishers), New Photographer Awards of the Photographic Society of Japan in 2003, etc. 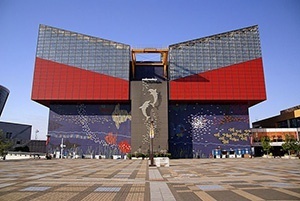 An aquarium that opened in 1990 as a center facility of the Tempozan Harbor Village in Minato-ku, Osaka. It succeeded to change the image of aquarium dramatically by reproducing the Pacific Ocean with its huge cistern. To see the aquariums, the visitors take an escalator to the 8th floor and then go down a corridor-like spiral ramp to the 4th floor. This unique style has won great popularity. The main feature is 3 floor-high the Pacific Ocean Cistern that locates in the center of the spiral ramp (from 4th floor to 6th floor). In this huge cistern with maximum length of 34 meters and depth of 9 meters, a whale shark can be seen swimming dynamically. The official web site of Akashi Create, co,ltd. Product information on JV34-260 that printed the large photographs and wrapping of the automatic locker in Kaiyukan.